Take a walk on the wild side and decorate with animal prints We’ve been seeing them everywhere in fashion, so why not decorate with them? 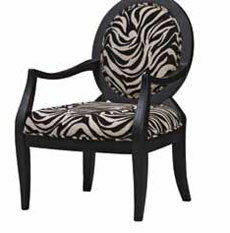 Animal prints are a naturally wild pattern that can give any room an instant “wow!” factor. Many people stay away from animal prints in fear that they will look tacky or the print will dominate the room and take away from other decorative elements, but when used tastefully, animal prints can add a touch of sophistication. Whether you want to take a subtle approach or make a bold statement, you can find an option to suit your taste! Zebra print is a great print to start off with if you’re a little wary of going in this direction. The black and white adds a visual element to a monochromatic color scheme, as well as complementing other colors. While many opt to incorporate zebra with a rug, the print can also inspire black-and-white design ideas in more unexpected spaces, such as a bathroom or a kitchen. If you’re looking for a bolder approach, take a look at prints with a loud pattern, such as giraffe or leopard. Accents with these prints look trés chic in rooms with a more neutral color palette. However, you must be careful that the print doesn’t dominate or compete with other elements. A good rule of thumb to follow is to only use one print on one item in a room. Don’t shy away from animal prints for fear that an innocent animal is covering your favorite chair or is lying on your floor in rug form. With today’s quality reproductions, it’s almost impossible to know the difference between authentic and faux skins on interior accessories. Also keep in mind that you’re not limited to safari prints like zebra and leopard. Cowhide looks great on rugs and upholstery, while crocodile and ostrich look fabulous when covering furniture pieces such as a coffee table, dresser or headboard. Before you venture to the wild side, decide what print suits the room you’re looking to decorate and what statement you’re trying to make. If a covered headboard is too much, opt for an upholstered chair, ottoman or chaise. Bedding, pillows or a throw can do wonders in a bedroom or living room (remember only one print per room) and towels, a bath mat, or even a shower curtain can revamp a bathroom!